Still working on the lime green socks! Crafting and collecting has stalled over the last two weeks, for one good reason and one sad. The good reason is that we finally got a stove fitted! It's completely wonderful. The fitters, Arrow Chimneys in Hitchin, were excellent, fast and left no trace of any mess or disruption anywhere. 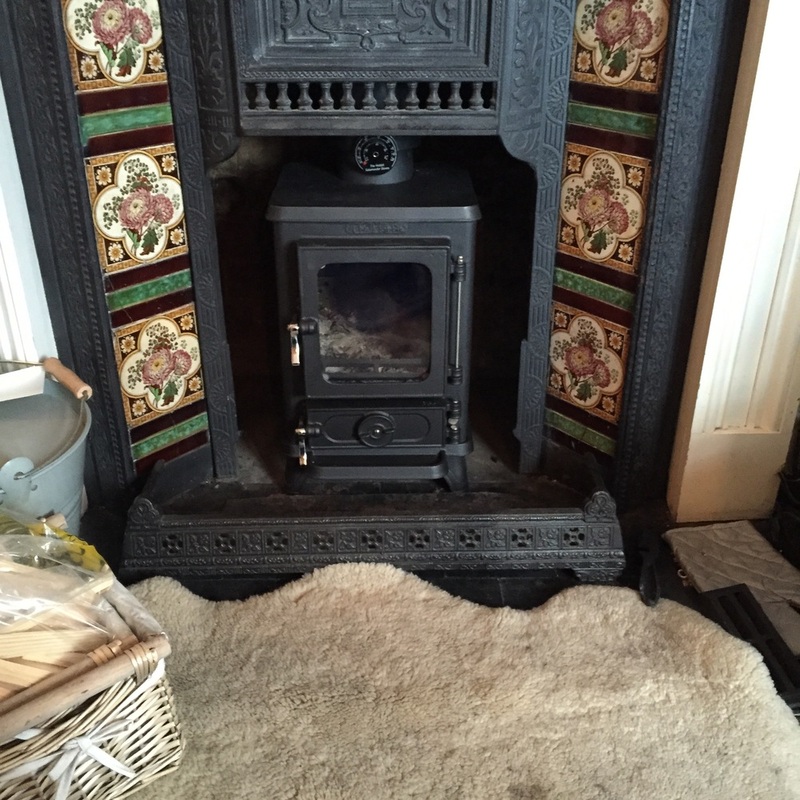 It was them who recommended this stove too; I'd wanted to keep as much of the original fireplace as possible as well as having a good stove. This is a Hobbit stove from a company called Salamander in Devon. Arrow fitted a stove for me three years ago in my old house and I can't recommend them highly enough. The cats are delighted and the difference it's made to our cosy front room is remarkable. Without the open chimney to vent through, the draught is massively reduced and there is a chance now for the fire to heat the room, not just race away up the chimney. The sad news was that my Grandad Edgar died on Monday. He was diagnosed with Alzheimer's a few years ago so it has felt as though we lost him long ago, but there's still a huge sadness there, and relief. It had gone far enough. He'd forgotten us, how to walk, how to swallow, everything. When I went to say goodbye to him in his last few days I commented to mum that he was like a tiny baby. Though it will take some time to stop running everything past his care, there is comfort that it is over for him. His nursing home were wonderful and carried out his wish not to go into hospital and so he passed away peacefully and with as much dignity as it's possible to have in the late stages of that horrible disease. For the first time in years I feel free to think about who he really was. The man who joined the RAF in WWII and dropped a bomb on his foot, accepted the surrender of a whole Italian squadron on his own because there was no one else around. The man who loved to travel and raised four children; who got me interested in trees, birds and gardening; who took me out the day after I'd expressed an interest in tennis and bought me a tennis racket of my very own before constructing a ludicrous and useless ball on elastic contraption so that I could learn to play without an opponent. The man who wanted everything to be possible for his grandchildren and didn't think twice about reaching into his own pocket to make sure they could. He was the worst gambler I've ever met and fell for every postal scam ever pushed through his letterbox because he truly believed that everyone was nice and trustworthy. RIP, Edgar Henry James Adkins.